Who can pass up a four-day Memorial Weekend in Santa Monica where "Surfside South #2" will be taking place, May 28, 29, 30, and 31, as folk dancers gather to celebrate the 26th Annual Statewide Festival? President Avis Tarvin of the South is anxious to welcome President Elmer Riba of the North, along with all folk dancers both North and South as they present their second Statewide. The stately old Miramar will again be hotel headquarters and the Kick-Off Party Friday night will tke plce right there in the Nautilus Room. So you couldn't make it on time? Well, don't miss the Picnic in Lincoln Park, Saturday from 10:00 a.m. till 2:00 p.m.
Chairman Dorothy Daw wants you to be on time for the Institute in the Auditorium starting at 2:30 p.m. The first of the Auditorium Festivals is Saturday night, with an afternoon and evening dance Sunday, and a get-away Festival Monday afternoon. The Installation Brunch, under direction of Al Dobrinsky, will be served Sunday morning in the Miramar. 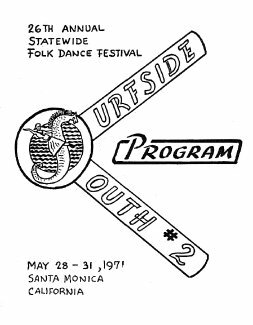 Along with numerous Festival and Camp announcements, you will find a Program listing all outgoing and incoming officers, along with dates and places of Statewide since Ojai and an ever-expanding list of Past Presidents. For the first time I will not be announcing the Oakland Feather River Camp as I conducted my last in 1970 after 18 continuous years. There comes a time, but it will be open for business with another instructor. The Saturday night and Sunday night After Parties will be held in the Miramar. The Past President's Party is extra-curricular and not listed in any program, but you may get an invitation from Don Spier to his Midnight Party if you are a friend. Of course he has no enemies. Of those Committee members not previously mentioned, here are a few who served over and above a normal expectancy: General Chairperson, Avis Tarvin who believes if you want things done right a safe way is to do it yourself; Program Chairman, Maria Reisch; Costume Parade, Elsa Miller; Dance Program, Ed Feldman and helpers; Exhibitions, Maria Reisch; Sound, Ralph Miller; Square Callers, Valerie Staigh; Publicity, Pearl Bleadon; and of course there were others we have missed but we must stop somewhere.